So, I don’t give many 5 star ratings out anymore. I’ve become much more conservative in my ratings since I started this blog. That being said, Scarlet absolutely blew me away. The Lunar Chronicles has been my favorite series of the year. 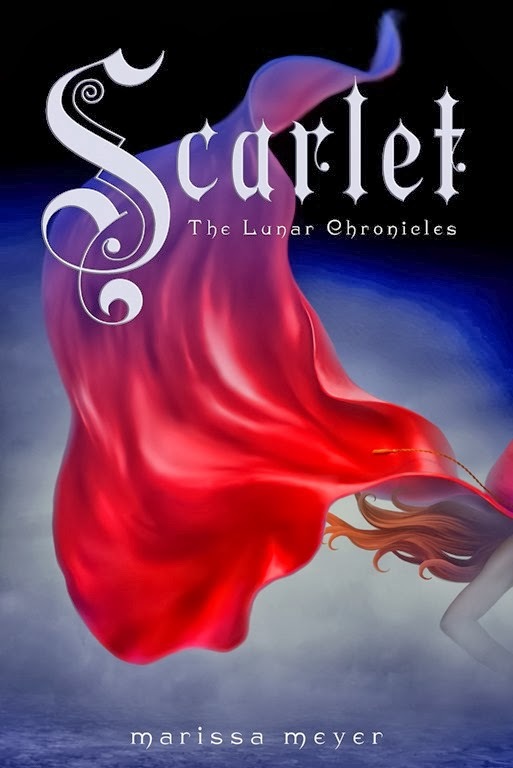 I was lame and didn’t read Cinder until earlier this year (see my review HERE), but soon after reading that awesomeness (which I also gave 5 stars to), I picked up Scarlet. I was a little nervous to read Scarlet because it sounded like Cinder and Kai wouldn’t be involved in the story at all, that it was a book about a completely different girl, and I was worried I wouldn’t care about Scarlet’s storyline. This book was AWESOME. If you’re looking for a good sci-fi, look no further. Marissa Meyer does an excellent job of making sci-fi approachable for people who don’t like sci-fi. I’m not one of those people, so I would have liked it anyway. And that’s not even mentioning the fluidity and crispness of Meyer’s writing. There was never a moment where I read something and thought, I would have worded that differently. Maybe that’s a testament to Meyer’s editors. Whatever the case, Scarlet is beautifully written. Great descriptions, awesome fight scenes, clever dialogue, and believable sci-fi elements make this book an immensely enjoyable read. Unfortunately, we’ll have to wait till Cress or possibly even Winter, the third and fourth installments, to get more Cinder and Kai action. There was none in Scarlet, sadly, although I thought it was good for the plot and character development that their romance was lacking. THANK YOU MARISSA MEYER FOR STEERING CLEAR OF THE LOVE TRIANGLE. It was so refreshing to not have a love triangle. I was worried about it with Thorne and Cinder, but they developed a very fun alliance that had nothing to do with romance. I dearly hope it stays that way. Scarlet and Wolf. Adorable. I think I may have liked them better than Cinder and Kai. And Cinder and Kai were pretty fantastic. So that’s saying a lot. Although, not gonna lie, I’m so excited to see Cinder and Kai back together. It was kind of painful for nothing to happen on that front (although, like I said earlier, good for the plot). Because I try to steer clear of major plot spoilers, all I’m going to say is there are secrets that I thought were very clever, with hints planted throughout both Cinder and Scarlet. I loved how the two stories wove together so naturally; Meyer did a great job tying all the storylines together. I can’t wait to see what she adds next. Sadly, Cress, book 3 in The Lunar Chronicles, doesn’t come out until February 4, 2014. I shall await it’s greatness patiently. This entry was posted in Book Reviews, Fairy Tales, Fantasy, YA and tagged Fairy Tales, Fantasy, Sci-Fi/Dystopia, YA.